Bringing the joys of astronomy to the public, as the RAS's motto says, takes a lot of time and energy. We've been doing it for more than 50 years. With monthly meetings, camping trips at dark-sky sites, telescope making, and ongoing outreach programs, the club stays extremely active. 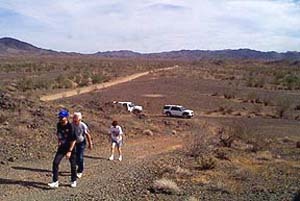 The search for dark skies near Red Cloud Road in November 1999. In the late 1990s, and especially in 1999, the club began a serious quest for property under dark skies to use as a permanent observing site. 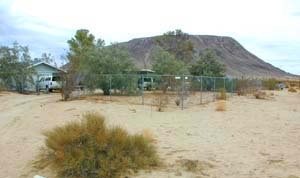 Their efforts were rewarded in a grand way when Paul and Mary Livio, of the Western Observatorium, donated to the RAS five acres of desert land in Landers, CA. The Livio's saw that the 200 members of the Riverside Astronomical Society had the the enthusiasm, the ability to work hard, the technical expertise, and the outgoing and friendly attitude that would be needed to develop this site into a working observing site. In August of 2000, the club took ownership of the property, raised some $15,000 in individual pledges and donations, and began their development efforts. The club established a Site Committee. 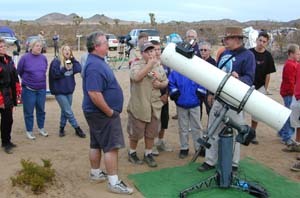 The group immediately set about making the site a good place for public and member star parties. Since the area had been used as a dump by people for some time, this meant cleaning and making the area safe to walk around and, more importantly, to set up telescopes. First visit to Landers Lane site in March 2000. Volunteers met at the site several times a month just to clean, put up fence posts, and discuss options. Some members solicited donations. Others spent hours with county planning officials, neighbors, and others to find out what was possible and what was not. A couple of people made signs, and many turned out at the monthly Star Parties. At the same time, the Site Committee generated a discussion among all the members about just what they wanted the place to be. The Committee conducted an extensive survey and learned about the needs of the membership. Finally, in February 2001, the Site Committee adopted a Master Plan, and gave the go-ahead to begin construction. Within a week, Phase I was largely completed. With the help of volunteers, the site was graded with spaces for a common telescope field, campgrounds, recreational vehicle pull-throughs, and parking for other visitors. 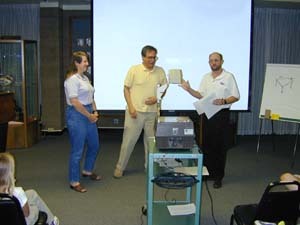 Paul and Mary Livio donate the property to the RAS, August 2000. The high point of the development of this site was the November 2001 Leonid Meteor shower, when 400 visitors came to witness ten thousand meteors. But it was becoming clear that the club could not economically overcome the zoning problems that would make it very costly to get permits for utilities and other construction on the site. The club, therefore, decided to reserve what would become known as the Landers Lane Site for possible larger star parties with the general public, and to look for a site that already had utilities and could be more readily further developed. Leonid Meteor Shower Event at Landers Lane site, November 2001. In April 2002, the club took ownership of a five acre plot about three miles north of the old site. GMARS, as it came to be known, already had a house, garage, and some fencing. 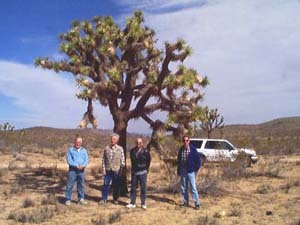 In the months following the purchase, volunteer crews made the place usable for small star parties. Since then, the club has developed a Master Plan, which includes policies regarding parking, campsites, the telescope field, telescope pads, and observatories. In March of 2005, the Landers Lane property was sold. Since 2002, GMARS has had too many improvements to list but they include the addition of more than 2 dozen concrete telescope pads, over a dozen observatory structures, upgrades to electrical and plumbing, roof repairs, and the acquisition of the adjacent property to the east (and all of its upgrades and repairs), to name just a few. All of this was, and continues to be, possible through donations, membership dues, and hard, physical labor of the RAS membership. GMARS (when it was called simply, "the Botkin Road Site"), September 2002. GMARS clubhouse and garage, September 2002.